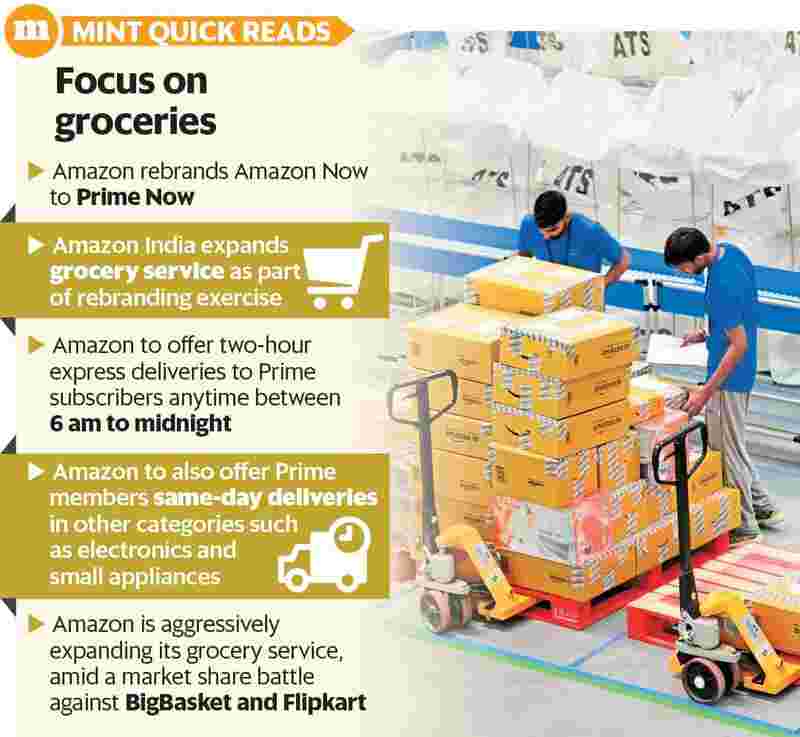 Bengaluru: Online retailer Amazon India Ltd has rebranded its online groceries service to Prime Now, while also expanding its service to include more delivery slots for customers. This is part of a broader revamp of its consumables and packaged consumer goods business that comes amid a bruising market share battle against market leader BigBasket and arch-rival Flipkart. Amazon’s new Prime Now offering, earlier known as Amazon Now, will also offer members of Amazon’s Prime subscription service same-day deliveries in categories such as electronics and small appliances, in addition to groceries and consumables, two top Amazon executives said in an interview. “We are rebranding Amazon Now to Prime Now. We are not just rebranding -- there are multiple benefits to our customers. First, our Prime members will get exclusive access to two-hour rush delivery. Other customers will continue to get the beyond two-hour delivery slots," said Sameer Khetarpal, director of category management at Amazon. Amazon said that Prime Now will provide two-hour express deliveries to Prime subscribers at anytime from 6am to midnight. “We’ve launched the Now Store, which has thousands of products that are not just grocery products, but also home and kitchen, electronics, among others," said Siddharth Nambiar, head of Prime Now at Amazon. “We are also launching the largest selection of electronics and home and kitchen products available with this ultra-fast delivery. We have categories like home and kitchen, mixer grinders, small appliances, home furnishings, as part of the expansion of our Now Store...We are really focused on the top four cities where customers value convenience. We’ve heard from customers that they would like different slots," said Nambiar. Prior to its latest revamp and expansion, Amazon used to offer a two-hour delivery service through its Amazon Now mobile app and encouraged customers to buy staples on its platform as and when they needed them. Now the company has realized that the previous strategy had its limitations and it needed a more aggressive approach to succeed in this category, according to a third Amazon executive, who requested anonymity. Amazon’s moves with faster, same-day deliveries and its expansion of the grocery and consumables business come at a time when well-funded rivals such as BigBasket and Flipkart, which was acquired by Walmart earlier in May, are aggressively expanding their grocery businesses and ploughing in hundreds of millions of dollars to grow them. Online grocery sales have taken off slowly and grown sluggishly, barely touching $1 billion in 2017, according to market research firm RedSeer Consulting Pvt. However, with the broader online retail market showing signs of recovery, growth in packaged consumer goods is also expected to pick up in a big way over the coming months, and average order value (AOV) is also expected to rise significantly, according to experts. In an interview last year in July, Amazon India’s head of consumables business, Saurabh Srivastava, indicated that the company would invest heavily in the sector and launch in more cities over the coming months.